The study of language has come a long way since Samuel Johnson describe himself as 'maker of dictionaries -- harmless drudge'. The emphasis in modern linguistics is on descriptive investigations of the way the world speaks -- and why. In Invitation to Linguistics, Richard Hudson explains what the subject is, why it appeals, how it works, what issues it confronts and the practical impact it can have on our social and professional lives. He poses puzzles in Latin and Zulu, visits realms of linguistic exotica, delves into deep grammar, unravels the ambiguities of everyday sentences (like 'John took off Mary's coat') and asks how language began, if we can think without it, and if it is unique to humans anyway. He shows how the study of this wide-ranging subject can help society solve its problems of literacy and language learning, facilitate the treatment of speech pathologies, help us use computers more effectively -- and how it can broaden our outlook, wiping out out-dated prejudices against non-standard speech and minority languages. Wide-ranging, realistic and provoking, this is a book that students thinking of studying lingusitics, or just launched on their courses, will read for enjoyment as well as instruction: a combination that makes it ideal, too, for anyone interested in words -- from crossword fanatics to anthropologists. 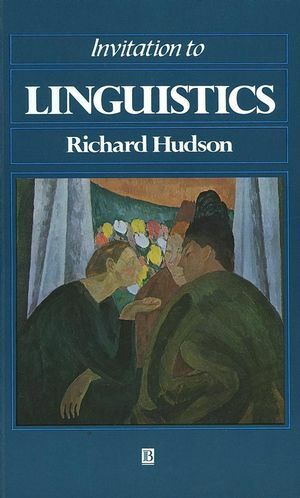 Richard Hudson is Reader in the Department of Phonetics and Linguistics at University College, London, and author of English Complex Sentences (1971), Arguments for a Non-Transformational Grammar (1976), Sociolinguistics (1980) and Word Grammar (1984). 2. The Pleasures of Linguistics. 3. Ordinary Language is Good. 4. Things You (sort of) Know Already. 5. Strange Goings-On in Language. 7. Theories: Boon or Bore?. 8. The Great Issues (Grey Tissues?). shows how the study of this wide-ranging subject can help society solve problems of literacy and language learning, facilitate the treatment of speech pathologies, and wipe out out-dated prejudices against non-standard speech and minority languages.